Every day people are finding new ways to use social media to get a job. As a job seeker, creativity will get you noticed. This is the last post in our Social Media series, and we wanted to share some of the successes and failures we’ve come across. I Take a moment to check out Part 1 and Part 2 of our series if you haven’t already. About ten years ago, my close friend Scott decided he wanted to work at ThoughtWorks Australia. He had a tendency to be a bit impatient back then, so instead of waiting for them to get back to his application he decided that he wanted to help expedite the process. He launched a campaign to get hired that included two Facebook ads that led to microsite complete with a slide show and the ability to prank call people. The slideshow he created demonstrated how his values aligned with those of the organization and included his accomplishments. Scott’s campaign became so popular that the ThoughtWorks Australia employees started #DearScott, which trended on Twitter briefly in Australia. He made it through their interview process and signed on as an employee not long after. Scott did a lot of things right. He was intentional about his word choices for the advertisement, focusing on being a part of the team instead of being an employee (with/for). When people clicked, the site didn’t just lead to a resume; it was interactive and engaging. He connected to the company values and focused on his accomplishments instead of his previous duties. The prank call aspect let his personality show through in a fun, harmless way. Lego Girl Gets a Job! About two years ago a recent college graduate used Legos to apply for internships at creative agencies. She created a mini-scale Lego model, complete with packaging that she used to apply for jobs at her top two companies. She customized the colors on the packages to match the agency branding and included an “instruction book” highlighting her skills. In addition to sending the kits, she posted the photos to Reddit, which got a lot of attention from the industry. Her initiatives worked, and a few weeks later she posted this follow-up. It’s important to be careful because mistakes on social media can cost you a job, or worse, your professional reputation. The next story is about another job seeker using Facebook advertising to get noticed by an employer. This time, it didn’t work out quite so well. The second example is a good reminder to be cautious of everything you post online, not only on your professional social media accounts. One of my marketing friends told me about a failed ad campaign that an applicant tried. The company name and job seekers name are hidden for privacy purposes. From what she tells me several employees spotted the ad, first appearing on their personal Facebook feeds. Then it also popped up in at least one article or blog post an employee was reading. The ad might have worked if it weren’t for one mistake. The position was in marketing, and this candidate used the wrong version of you’re, not once, but twice in the same advertisement. In a job where attention to detail is so important, the candidate pretty much guaranteed they won’t be getting a callback. An interesting article came across my news feed from SHRM, a professional organization for HR people. The article headline was “Vulgar Comments on Dating App Cause Recruiter to Dismiss Candidate.” The short story is that a recruiter was cruising Facebook when she saw her friend shared a Not Safe For Work Screenshot of some vulgar and threatening messages she received from a man on her Facebook news feed. The recruiter thought the guy looked familiar, so she did a reverse google image search of his OKCupid photos. It turned out that the picture search led her to the guy’s LinkedIn profile, with the same photo. She rejected him from the candidate pool and sent a note telling him to be nicer to women. Her actions in dismissing the applicant were completely legal. If she had decided to move forward with the candidate given what she had seen and some issue happened at work, the company could be held liable for negligent hiring. What’s the key takeaway here? Don’t use your professional profile photos in places you don’t want your employer to see. Be careful what you post online in general. There is an increasing blend of people’s personal and professional lives. Anything you put out into the world can be captured and shared. Think about what you’re putting out in the world and who you’re sending these things to. And honestly, just be a nice person. The other day this came across my Facebook feed just in time for this article. A friend of mine works at Zulily, and he recently received a mysterious hand delivered letter. Before he opened it, he posted a photo on Facebook. 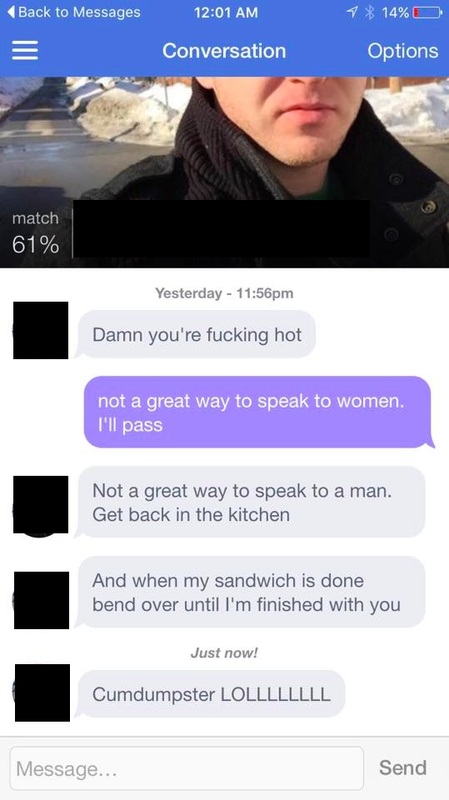 His name and photo are blurred for privacy. The person sending the message put in a lot of work and thought into his efforts. He researched the company, and he included an original signed recommendation, and he followed up on LinkedIn after it was delivered. Unfortunately, there were critical errors. Remember when we talked about proofreading? Here is another example of a spelling error. It comes across as a lack of attention to detail. The second error was that he had the wrong hiring manager. My friend did end up passing the information along to the right person in the end, but those two mistakes might be a deal breaker for the hiring manager. Oh, and as far as my friend’s informal survey? Two people said creepy/unprofessional because of the spelling along with sending it to the wrong person, and one person voted for being a go-getter. Thanks for sticking with us through the series. Have you ever tried any of these tricks? We’d love to hear if they worked out for you. Tell us about them in the comments.